Advances in low-dispersion optical glass and exotic anti-reflection coatings, along with the latest in computer-aided manufacturing are combined to produce lenses of unprecedented quality. Rather than raising the cost of Opteka filters however, these advanced materials and techniques allow more efficient and economical production. The results are lenses of remarkable quality and durability at remarkably affordable prices. 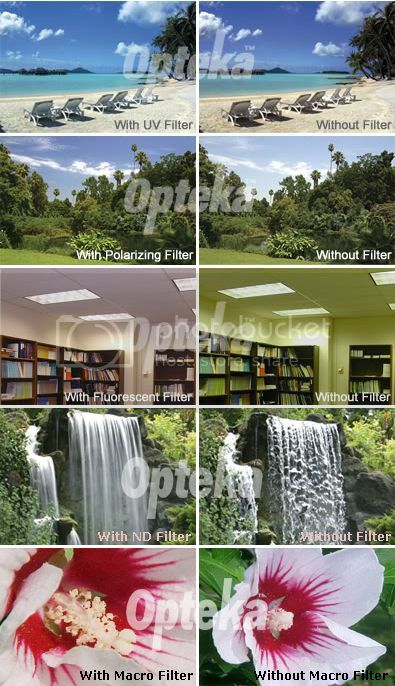 Nothing changes the way you see the world like High Definition² and no company does High Definition² like Opteka. Opteka's glass optics define High Definition. Change the way you view the world. Enjoy outstanding detail, enjoy enhanced clarity, enjoy Opteka. A must for any camera. Penetrates haze, adds warmth, and protects your valuable lens from scratches, dirt, fingerprints, etc. Leave it on your lens at all times. For shooting in bright sun, at beaches, snow, etc. Controls bright light entering lenses for a better balanced color image. Darkens blue skies and reduces reflections from non-metallic surfaces. Reduces the greenish cast common to fluorescent lighting and produces pleasing, natural results, particularly in flesh tones. Enables slow shutter speeds to be used, especially with high speed films, to record movement in subjects such as waterfalls, clouds, or cars. Decreases depth of field by allowing wider apertures to be used, which helps separate subjects from their background. Now you can take close-up shots like you never took before, Enables you to get much closer than the minimum focus of the standard camera lens - as close as 4 inches from the subject. Originally designed for dentists and medical use. Made with high definition optical glass that provides unbelievable detail. .